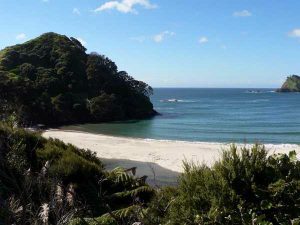 Great Barrier Island is famous for its magnificent uncrowded beaches.Whether you are looking for a safe seaside spot that’s close to everything for the family, a boulder beach to explore or an empty surf beach to go swimming and picnicing at, you’ll find what you’re looking for here! Even at the height of a winter storm, going to the coast to watch and feel the power of nature can be an exhilerating experience. The west coast of the Island offers sheltered, gentle beaches like Gooseberry Flat and Pah Beach in Tryphena,Okupu beach in the centre of the Barrier and the sheltered bays of Port Fitzroy in the north. Johnsons Bay close to the southern tip is a boulder strewn peice of coast, great for snorkling and exploring. The east coast has the empty and clean, white sand surf beaches that captivate visitors with their beauty.Sit at Medlands and watch the breakers roll in from the open ocean or head north to Kaitoke and Palmers and lose yourself amongst the waves. Further north is Harataonga,an exquisite small bay which is part of the D.O.C. preserve followed by stunning Whangapoua, a long white strip of sand and dunes with the Okiwi estuary and wetlands behind it, Arid Island ( Rakitu) visible 6km offshore and the gravesites of the unfortunate victims of the shipwreck of the Wairarapa at the northern end. At Stray Possum Lodge we advise our guests to take a few precautions for their safety when visiting the coast. Sun block is a must here as the reflection from the sea can burn as much as the sun above. Don’t swim outside your comfort zone and ability level… there are no lifeguards to save you if you go out too far or get caught in a rip. Always keep at least one eye on your children while they are in the sea, and take plenty of fresh drinking water with you.